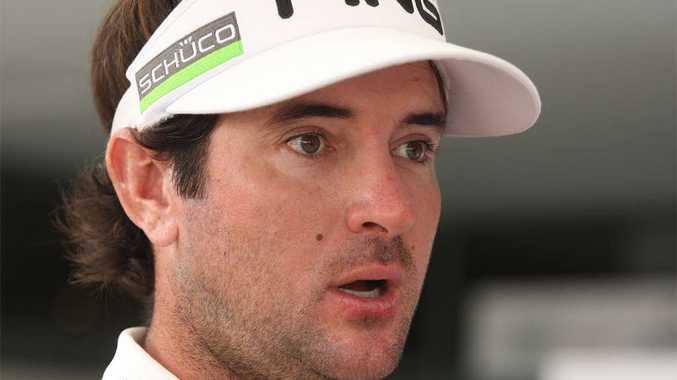 BUBBA Watson believes it's crucial to pick up shots on the front nine and hold your nerve on the back nine at the Hyatt Regency Coolum. The 33-year-old American will head into today's final round of the Australian PGA Championship on 12-under par - just a stroke off the pace being set by K T Kim - after a third-round effort of three-under par 69. And he knows it will be important to get off to a good start. "You have three par-fives (almost) in a row, you have a short number four and you have a par-three that is giving up holes-in-one on number two, so you can score early, but then it kind of slows down," he said. "On the back nine, the wind is different. The wind makes it worth just pars. "So you can start off really hot and put some pressure on some people (and) someone in the back of the field can easily jump up real quick." When Watson produced his trademark booming drive on the first hole at Hyatt Regency Coolum to bag his second eagle there in as many days, he got off to a great start yesterday. The Presidents Cup player banged the ball 321 metres down the middle, nudged a nine-iron on to the dance floor and knocked the ball in to quickly reel in Marcus Fraser's overnight leading margin of two. But Watson's seemingly smooth ride through round three came unhitched when he pushed his ball to the left of the green on the relatively benevolent par-five 15th, which has caused him some grief this week. He struggled with two chips before finally stumbling away with a double bogey. He then received a stroke of good fortune when his approach shot to the famous par-four 18th hit someone in the gallery and went back on to the green but he salvaged par with a clutch putt to earn a berth in today's final pairing alongside Kim. But Watson will be keeping a good eye on third-placed Aaron Baddeley, who will be in the group ahead of him. "We've been having fun. My room is right next to Aaron Baddeley's and Rickie Fowler's, so all of our families have been hanging out all week, been goofing around," Watson said. "But obviously when we tee up it gets back to golf and gets the pressure going. "Once you tee it up, golf is golf. "We all have a drive. We all have a push trying to win golf tournaments."